Lake O'Hara is one of the most sought-after hiking destinations in the Canadian Rockies. We were lucky enough to make the reservation to the hardest bus to get on in British Columbia, and now we can share with you one of the best backcountry hiking experiences we've ever had. The natural gem consisting of crystal clear lakes, hanging valleys, and towering snow-capped mountains awaits in Yoho National Park. Lake O'Hara is a unique lake in Yoho National Park in the province of British Columbia, Canada. As the whole area of the Canadian Rockies is well-known for its crystal clear turquoise lakes and incredible snow-capped mountain peaks, you might wonder why particularly this lake receives that much attention and why it stands out among other destinations in Canada. One of the reasons might be the hiking-friendly environment - with so many accessible trails starting right from the lake, hikers can easily spend days here without getting bored. Also, the nature around Lake O'Hara is unique and fragile, and the Yoho National Park management works hard to preserve such an extraordinary place by a strict reservations system when only the limited number of interested people can visit the area daily. Last but not least, the lake itself and the most famous Opabin Prospect viewpoint is just stunning and worth the effort. If you are planning to visit the Canadian Rockies, Lake O’hara is a must include in your travel itinerary. To get to Lake O'Hara, you have two options on how to get in. The first option is to walk in and out on your own. The advantage is that you don't need to make any reservation, you'll avoid the hassle and still will be able to enjoy the scenery, the huge disadvantage is, that it is 11 km each way on a gravel road through a thick forest which is not particularly exciting. It means you'll spend 4-6 hours only to get in and out plus another 5-8 hours hiking in the Lake O'Hara area. The way to the lake is uphill and doable in 2-3 hours and count the same amount of time for the way back as you will be most likely tired. The other option makes more sense, take less effort (in a physical way), but is tricky to manage, and the success is by no means guaranteed. You can make a bus reservation ("the hardest bus to get on in British Columbia") and within 30 minutes arrive in Lake O'Hara, where you are allowed either spend one day and go back the same day, or you can stay for up to three nights in the campground. We were fortunate enough to book the seats on the bus, so we left our rental car at the parking lot and boarded a shuttle bus. Every year when the booking system opens for the season, only a fraction of people secure their seats. In numbers, about 17 000 of hopeful mountain lovers try to book the bus to Lake O'Hara, but only about 1 000 succeeds. We cannot describe how lucky we felt when we managed to make the reservation for an overnight stay. But let's have a look how to make your Lake O'Hara reservation. The Lake O'Hara bus runs mid-June through the end of September or early October and is bookable from the late April - you can check the updated information here. The bus goes four times a day to the lake: 8:30, 10:30, 15:30, 17:30 (the last two times are available for overnight campers only) and five times back to the parking lot at 9:30, 11:30, 14:30, 16:30 and 18:30. The reservation process itself is painful. You can either try to book online through the outdated reservation system or call the Lake O’Hara Reservation Line. The reservation process starts at 8 AM MTD time and to be honest we sat in front of our PC from 7:45 AM. When the exact time has come, we immediately tried to make a reservation, but all dates available were suddenly red and fully booked. We have no idea how it happened and how some people were able to book it, but we were left disappointed without seats. The one day visit is probably the most popular one, and if you don't succeed, you cannot do anything else but wait if someone cancels (it usually happens when the last minute weather forecast is exceptionally poor). We were lucky enough to book an overnight camping site. It was also gone right away, but someone canceled, and the re-opened spot automatically comes with a seat on the bus. The Lake O'Hara bus costs $14.70 for roundtrip or $9.75 for an outgoing ride only. You also have to cover the reservation fee which is $4.50 per ticket for 1 or 2 people when booking online or $6.25 per ticket when booking over the phone. If you are traveling in a party of 3+ people, there is a flat reservation fee $11 when booking online or $13.50 if booked by telephone. All reservation fees are non-refundable. You have several options where to spend a night in the Lake O'Hara area, and it only depends on your budget and the required level of comfort when it comes to the accommodation. Sleeping in the Lake O'Hara campground is the cheapest and also the unforgettable experience where we could feel the connection with nature. Spots are reservable only via phone three months in advance of your planned visit (the campground is open mid-June through the end of September). You can stay here for the maximum of three nights and reservation is possible to make for up to two tents (1 per each site). This backcountry camping was one of the best we've ever stayed in. It has a cooking shelter, clean toilets, bear lockers for each site, wood, and running potable water. The camping fee is $9.80 per adult per night plus return bus fee plus $11.70 non-refundable reservation fee per party. Read More: How To Stay In Bear Country. Elizabeth Parker Hut is another option where to stay, the hut is open year-round, but the booking system is lottery based! The lottery opens every fall, and the Alpine Club of Canada is the organization operating the service. You can enter the lottery as many times as you want, each time you must pay $10, and every time you must select the dates you are after and the length of stay. The chance to win is much higher in the winter than in the summer months. The Elizabeth Parker Huts cost $35 per person per night for Alpine Club of Canada members or $45 per person per night for non-members. Although the membership doesn't affect the chance of a win, at least one member of the party (the one who is making the reservation) must be a member to be able to finish the reservation process. Once the winners get their confirmation, they can also book a shuttle to the lake via ACC. The hut can sleep 20 people in the winter and 24 in the summer. By no means, the most luxurious accommodation type in the area is Lake O'Hara Lodge. Situated on the lakeshore, the lodge offers stunning views, upscale accommodation considering you are in the wilderness and great dining options. Even though the rates are around $1000 per night including meals, the lodge is very often fully booked by those, who want to enjoy the incredible scenery and the comfort of high-end accommodation. We usually are not travelers who spend that much money on a single night, to be honest, we consider it crazy to pay that much only to sleep inside, but after we saw pictures of the lodge, we must admit that we were a little bit jealous, when coming back to our tent. Read More: Canadian Rockies - Cost of Travel. 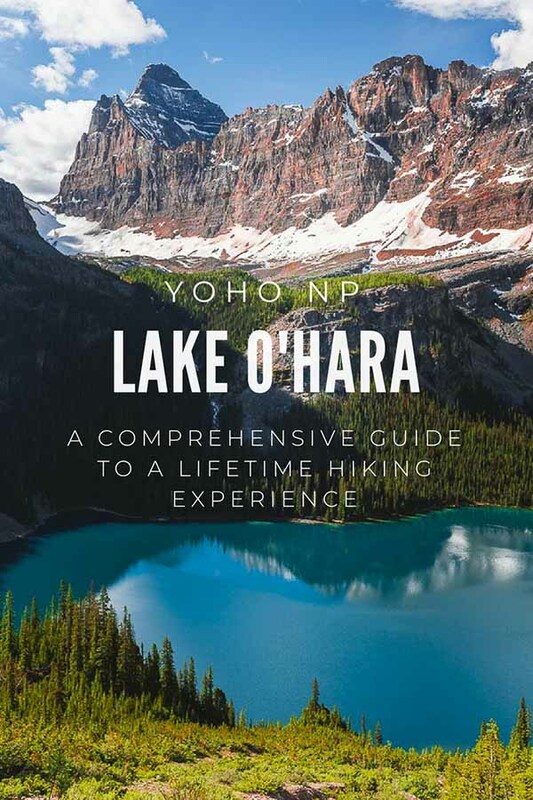 The beauty of the trails in the Lake O'Hara surroundings lies in the actual proximity to the lake and also in the variety of how to plan your day. You can either walk around the lake, hike demanding Alpine Circuit which connects the most beautiful spots and viewpoints, or you can pick one or two places and climb from the lake directly to your point of interest. We hiked the Lake O'Hara Alpine Circuit but did not make it to All Soul's Prospect as it was still snowbound in late June, and if we walked the whole trek, we would've missed the outbound bus. We've made a list of places which are unquestionably worth to visit. The trail up to Wiwaxy Gap is steep but not that long, and we were very soon above the tree line and rewarded with incredible vistas. The Wiwaxy Gap is the highest point of the Alpine Circuit, and we found it best to hike here first when we were still full of energy. Huber Ledges connects Wiwaxy Gap with Lake Oesa. It is a rocky, and easy to follow the trail and it is for sure better to walk it down than in the other direction. Rocks are very slippery when wet, so be cautious. Read More: Best Moderate Hike In Lake Louise. Lake Oesa is another beautiful lake which ends with majestic peaks. From here, you are an only short distance from well-known Lake Louise and Plain of Six Glaciers Trail, located only on the other side of the valley. It is incredible how different this place is. Quiet, without crowds, it was just us, marmots and chipmunks. The trail connects Lake Oesa with Opabin Plateau and offers great views while you'll be walking through scree and slippery snow sections and under The Yukness Ledges towering above. Watch your steps and also look up to make sure there are no rocks falling. Opabin Lake is the main feature on the Opabin Plateau. The Plateau is a hanging valley atop a rocky cliff above Lake O'Hara and is also home to several smaller alpine lakes which flows down the valley altogether with melting snow and creates waterfalls. Do you love waterfalls? Visit the Gray Provincial Park: The Land of Waterfalls. 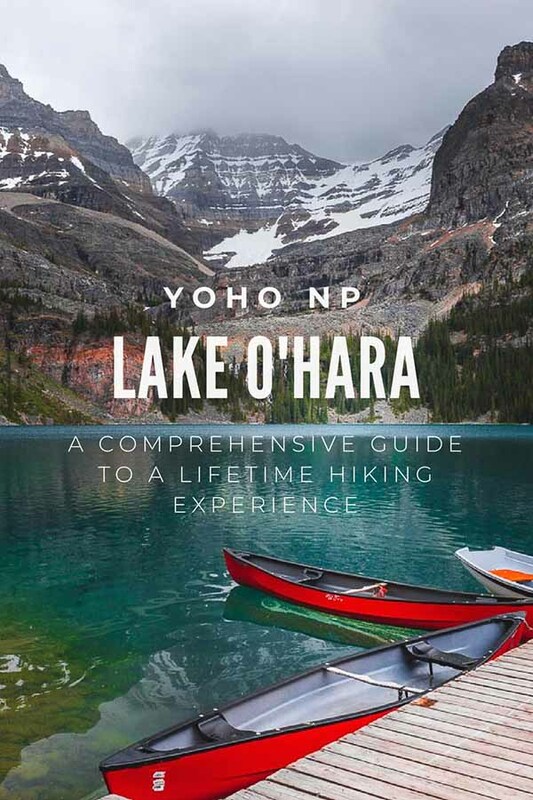 We've handpicked the best hotels in three different locations close to Lake O'Hara where you can base yourself before or after hike. Lake Lousie | Lake Louise Inn - Modern, efficiently designed with views of the surrounding mountains. Golden | Best Western Mountainview Inn - Clean rooms, convenient location, all rooms are air-conditioned and excellent breakfast is included. Banff | Banff Park Lodge - An environmentally friendly hotel located in the town center surrounded by stunning scenery. Probably the most photographed place on the whole Lake O'Hara Circuit. It is not well-marked, but from Opabin Plateau, take Opabin Prospect route and eventually in about 15 minutes you'll get there. Stand on the rocky outcrop and enjoy one of the greatest views in the Canadian Rockies. The view of Lake O'Hara and adjacent Mary Lake will leave you speechless! Read More: Our favorite lakes in Canadian Rockies. If you are looking for an undemanding walk and yet want to get the sense of the place, the Lake O'Hara Lower Circuit is a must. An easy well-maintained trail encircles the lake, and you can enjoy the peaceful atmosphere, beautiful mountain peaks around and waterfalls running down the slopes. Undecided About Where to Go Next? Read our Guide to one and only Icefields Parkway.